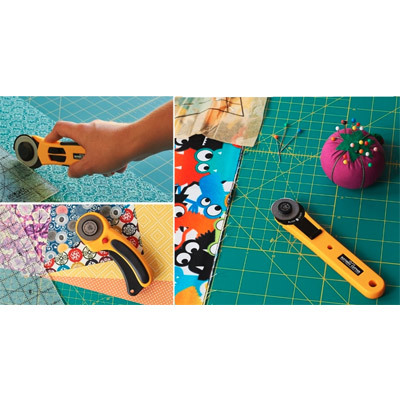 The Cotton Patch supplies a wide variety of rotary cutters, rotary cutting mats and rulers for patchwork and quilting. If you are unsure how rotary cutting works with patchwork and quilting then please ask for a demonstration. We have offers on Mat, Cutter and Ruler Sets. Our products include those from: Omnigrid, Olfa Rotary Cutters, Fiskars, Prym, Clover, EZ Quilting, Truecut and Olipfa. Ask our knowledgable staff about which is the best rotary cutter for you and you can see examples of all the different types. As well as providing one of the best selections of patchwork and quilting rulers in the UK we also have a variety of accessories for rulers. The Double Patchwork Ruler Grip is for if you find holding the ruler difficult then you may find it makes things easier to have a large handle to hold onto. This is a great addition to your tools cupboard.